August 8, 2010 11:05 am By Lori Post contains sponsored/affiliate links and I get commissions for purchases made from links. As an Amazon Associate I earn from qualifying purchases. Get a printable version of this shopping list HERE. In addition to the Staples deals listed below, you’ll find 25-50% off backpacks, $30 computer desk or chair and a $5 off $50 coupon. August 8, 2010 4:30 am By Lori Post contains sponsored/affiliate links and I get commissions for purchases made from links. As an Amazon Associate I earn from qualifying purchases. 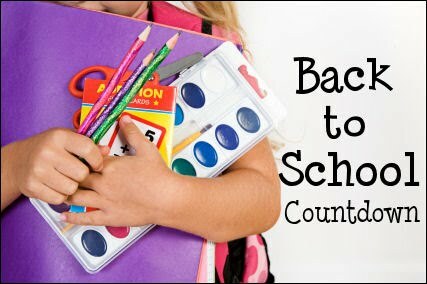 Last chance to get 140 name labels shipped in time for back-to-school for just $3! Labels are free, you’re just paying shipping. 2) You’ll come to a screen with only 24 designs. Don’t worry. You’ll see an option on the left of the screen that says INTERESTED IN MORE DESIGNS? Click on that. Then find the Kids category. 3) Use the Advanced Editing to change your font style and size to your liking. These are perfect for pencil boxes, lunch boxes, school folders, gym bags, reusable containers…all the stuff that gets lost at school! For younger kids, they’re good for sippy cups, bottles and snack bags. August 7, 2010 6:00 am By Lori Post contains sponsored/affiliate links and I get commissions for purchases made from links. As an Amazon Associate I earn from qualifying purchases. 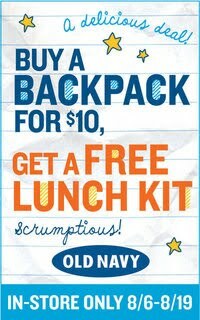 Now thru 8/19 you can buy a backpack at Old Navy and get a free lunch kit! Details on their Facebook page! Before you go, you can stop over HERE and play the game to get a printable coupon. I got $10 off $50! August 2, 2010 3:58 pm By Lori Post contains sponsored/affiliate links and I get commissions for purchases made from links. As an Amazon Associate I earn from qualifying purchases. Kerri over at Save At Home Mommy has done the work for me this week. She has a wonderfully organized spreadsheet of all the deals available so you can easily find the best price. July 25, 2010 5:38 pm By Lori Post contains sponsored/affiliate links and I get commissions for purchases made from links. As an Amazon Associate I earn from qualifying purchases. Get a printable version of this shopping list over HERE. rebate in lieu of subscription! 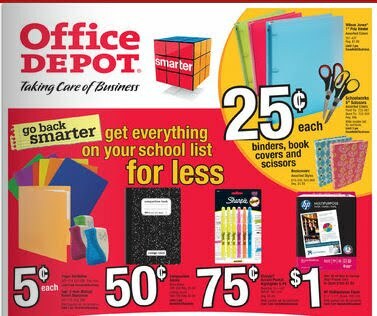 -DG Office Index Cards 100 ct.
-DG Office Yellow #2 Pencils 10 ct.
-Elmer’s school glue, 4 oz. 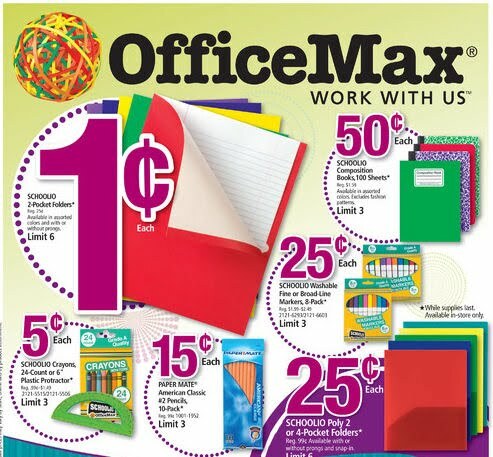 -Filler Paper – wide or college ruled 125 ct.
-Liqui-Mark colored pencils, 12 ct.
July 25, 2010 1:00 pm By Lori Post contains sponsored/affiliate links and I get commissions for purchases made from links. As an Amazon Associate I earn from qualifying purchases. Thanks to Nicole’s Nickels for sending these deals over. You can read the Dollar General official coupon policy HERE. July 25, 2010 12:37 pm By Lori Post contains sponsored/affiliate links and I get commissions for purchases made from links. As an Amazon Associate I earn from qualifying purchases. Thanks to Sarah’s Deals for compiling this list. 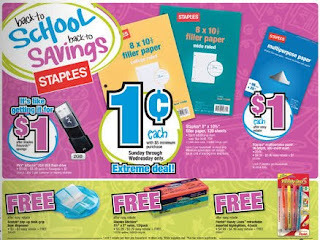 Remember, FREE rebate items require an additional $10 non-rebate purchase to qualify. All qualifying items will automatically get a separate receipt printed at checkout. Be sure to visit the service counter to get a rebate form for each item (or print one HERE) and follow instructions on the form. Your rebate will be in the form of a Menards merchandise credit. Stop over HERE to find a store near you. July 24, 2010 3:13 pm By Lori Post contains sponsored/affiliate links and I get commissions for purchases made from links. As an Amazon Associate I earn from qualifying purchases. 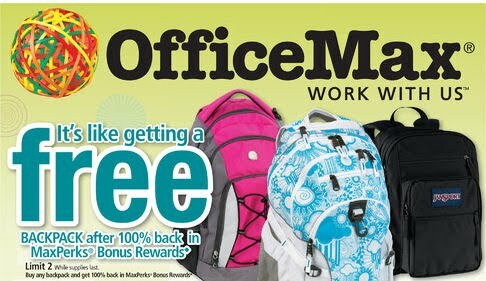 How about two more free backpacks? Office Max is jumping on the Free Backpack Bandwagon, which is just fine with me. You’ll get to choose any two and get 100% back in Maxperks Bonus Rewards. I’ll let you know if I find any store coupons to sweeten these deals! July 24, 2010 2:52 pm By Lori Post contains sponsored/affiliate links and I get commissions for purchases made from links. As an Amazon Associate I earn from qualifying purchases. The free backpack deal is back! 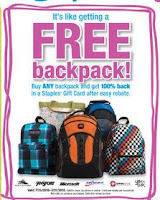 Buy any backpack and get 100% back in a Staples gift card after EasyRebate. Stop in Sunday AM for best selection.